Cairo: To Sheik Abdel Moneim el-Shahat, the Muslim Brotherhood's call to apply only the broad principles of Islamic law allows too much freedom. "I want to say: citizenship restricted by Islamic Shariah, freedom restricted by Islamic Shariah, equality restricted by Islamic Shariah," he said in a public debate. "Shariah is obligatory, not just the principles—freedom and justice and all that." The unexpected electoral success of the Salafis—reported to have won about 25% of the votes in the first round of the elections, second only to the roughly 40% for the Muslim Brotherhood's Freedom and Justice Party—is terrifying Egyptian liberals and troubling the West. 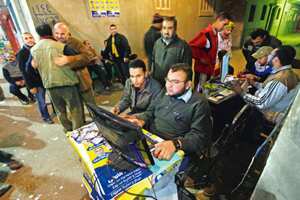 But their new clout is also presenting a challenge to the Muslim Brotherhood, in part by plunging it into a polarizing Islamist-against-Islamist debate over the application of Islamic law in Egypt's promised democracy, a debate the Brotherhood had worked hard to avoid. "The Salafis want to have that conversation right now, and the Brotherhood doesn't," said Shadi Hamid, a researcher with the Brookings Doha Center, a Brookings Institution project in Qatar. "The Brotherhood is not interested in talking about Islamic law right now because they have other priorities that are more important. But the Salafis are going to insist on putting religion in the forefront of the debate, and that will be very difficult for the Brotherhood to ignore." The Brotherhood, the venerable group that virtually invented the Islamist movement eight decades ago, is at its core a middle-class missionary institution, led not by religious scholars but by doctors, lawyers and professionals. It has long sought to move Egypt toward a more orthodox Islamic society from the bottom up, one person and family at a time. After a long struggle in the shadows of the Mubarak dictatorship, its leaders have sought to avoid potentially divisive conversations about the details of Islamic law that might set off alarms about an Islamist takeover. But their evasiveness on the subject has played into long-term suspicions of even fellow Islamists that they are too concerned with their own power. The Salafis are political newcomers, directed by religious leaders who favour long beards in imitation of the Prophet Muhammad. Many frown on the mixing of the sexes, refusing to shake hands with women let alone condoning any sort of political activity by them. Although their parties are required to include female candidates, they usually print pictures of flowers instead of the women's faces on campaign posters. And while the Salafis' ideology strikes many Egyptians as extreme and anachronistic, their sheiks command built-in networks of devoted followers, and even voters who disagree with their puritanical doctrine often credit the Salafis with integrity and authenticity. After the first election results last week, the Brotherhood's Freedom and Justice Party quickly declared that it had no plans to form any coalition with the Salafis, with some members already ending months of restrained silence by striking back. In an interview after the vote, for example, Dina Zakaria, a spokeswoman for the party, derided the Salafis' prohibition on women in leadership roles and refusal to print the faces of their female candidates. Such debates, however, threaten to knock the Brotherhood off the fine line it has attempted to walk. In public statements, the party's leaders have preferred to focus on broader themes of Islamic identity and the bread-and-butter questions that are more urgent concerns of voters. On the campaign trail, the Brotherhood sometimes even seems to appeal to both sides from the same podium— sounding like Salafis themselves one minute but avowing moderation the next. "To give your vote for Islamists is a religious issue," an Islamic scholar, Sayed Abdel Karim, declared at a campaign rally in Giza, across the Nile from Cairo, calling for "the rule of God, not the rule of the people." "The revival of Islamic spirit in the region is a direct threat to Israel and the future of the Western civilization, Europe and the U.S.," he declared, asserting that "the enemy media" were already saying that "those who love Jews, the United States and Europe should make every effort to keep the Islamic spirit dormant. Look at the conspiracy!" But moments later, the main speaker and the top candidate on his party's list, Essam el-Erian, declared that the party believed only in nonsectarian citizenship for all, that Christians and Muslims should enjoy equal rights as "sons of the nation" in the eyes of a neutral state and that the next Constitution should protect free expression. And he pledged warm relations with any nation that respected Egypt's "independence and culture." (Brotherhood leaders have said they support retaining the 1979 Camp David peace treaty with Israel, with some possible modifications, while the Salafis have sometimes talked of putting it to a national referendum.) "The garrison of religion in Egypt has special characteristics," Erian declared, "tolerance and moderation." Leaders of the Brotherhood's party have endorsed public commitments to protect individual rights. And its platform strikes a consistent theme of eschewing the quick prod of legal coercion in favour of encouraging private endeavours toward gradual change. Unlike the Salafis, it has not proposed to regulate the content of arts or entertainment, women's work or dress, or even the religious content of public education. In fact, the party's platform calls for smaller government to limit corruption and liberalize the economy. Instead the party proposes to nudge Egyptian society by the power of example. In culture, it would encourage "self-censorship" by asking artists and writers to sign a voluntary "code of ethics." The government, meanwhile, would support music, films and other arts that extol religious and family values.